For me, fall is marked not by the cooler weather and changing leaves but rather the return of Starbuck's pumpkin spiced latte. I literally jumped for joy when I learned that Hershey's is making pumpkin chocolate kisses. I just LOVE pumpkin. Soups, stews, treats, pie...pumpkin everything! My local supermarket was having a sale on organic pumpkin puree, so I am fully stocked for the next month. Therefore, I hereby officially debut my fall 2012 obsession with these Pumpkin Crunch Muffin Bites. 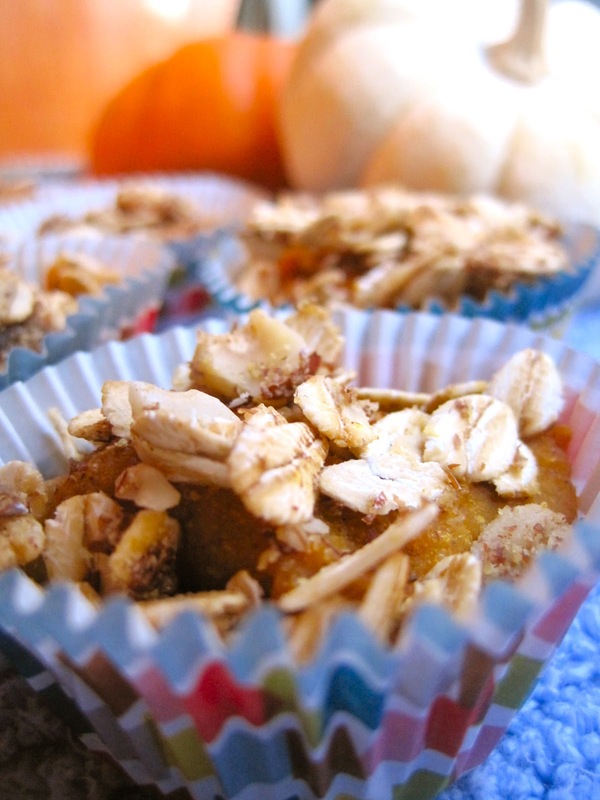 I explored cakes, loaves, breads, puddings, and cupcakes, but settled on muffin bites for my pumpkin baked treat. My rationale was twofold: 1, as a girl I like all things mini because they are cute, and 2, I have portion control issues, and if I had a baked a loaf of pumpkin bread I probably would've eaten it, sliver by sliver, in one day. [Insert stomachache here]. So! These muffin bites are perfect because I can pop one into my mouth for a sweet pumpkin treat after lunch and dinner every day for two weeks. Mollie Katzen describes these as tasting like "an entire holiday season." They do. The ginger spice and orange peel are what differentiate this recipe from other traditional pumpkin muffins: the ginger contributes a spicy biting undertone, like a gingersnap, and the orange peel adds a slight citrusy bitterness that prevents an overly saccharine sweet. These zesty ingredients complement the mild pumpkin well. No worries if you don't want to splurge on the extra tools (and time) required to make these muffins "mini", you can easily bake them full size too! I've included directions for both below. 1. Preheat oven to 350 degrees. Line baking pan with mini muffin cups and lightly spray with nonstick spray. (If making regular sized muffins, spray 8 standard-sized muffin cups, and preheat oven to 400 degrees). 2. Combine the flour, salt, baking powder, spices, granulated sugar, and orange zest in a medium-sized bowl, and stir until well blended. Crumble in the brown sugar, and mix with a fork and/or your fingers until thoroughly combined. 3. Measure the pumpkin into a second medium-sized bowl. Add the egg, milk, vanilla, and cooled butter or oil/applesauce and beat with a fork or a whisk until well blended. 4. Slowly pour this mixture into the dry ingredients. Stir with a spoon or a rubber spatula from the bottom of the bowl until you have a uniform batter. Don't overmix. 5. Spoon the batter into the prepared muffin cups. For a serious time and energy saver, spoon the batter into a plastic bag, sealing tightly, and cut off the bottom corner of the plastic bag, leaving a 2 millimeter hole. Then, similarly to frosting a cake, carefully squeeze 1 dollop of batter through the hole into each mini muffin cup. If making regular sized muffins, fill tins with batter using 2 spoons: One to scoop up the batter and the other to push it into the cup. 6. Prepare granola topping by mixing all ingredients in a small bowl. Sprinkle each muffin with 1/2 teaspoon of crumbled granola. Press granola lightly into batter. 7. Bake for 15 minutes (20 to 25 minutes for regular sized muffins) or until lightly browned on top, and a toothpick inserted all the way into the center comes out clean. Remove the pan from the oven, then remove each muffin from the pan, and place on a rack to cool for 10 minutes. Muffins can be stored in covered containers or resealable plastic bags. .
YUM. I can't wait to try these! Plus it's so nice to see a pumpkin bread-y recipe that doesn't call for a ton of butter. Gorgeous photos too!